In 18th century, English merchants introduced tea to Sultan Moulay Ismail, as an attempt to find an alternate market in the Moroccan people. Eventually a cultural love of tea was sparked, and Atai (the traditional Moroccan tea ceremony) was born. Often called the ceremony of hospitality (or friendship); it is performed by the male head of a Moroccan family for a guest of the house, and can be considered impolite if turned down. 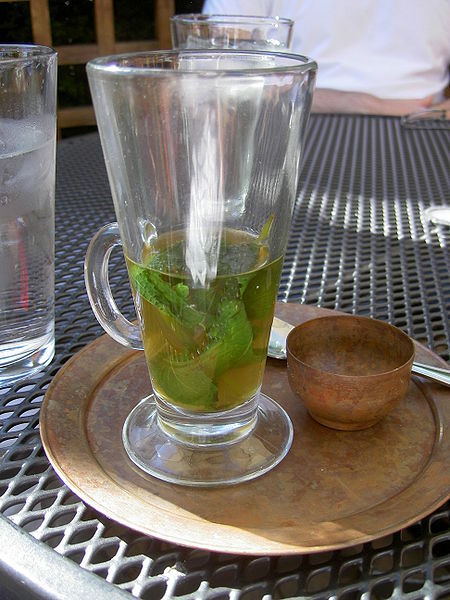 Most often, tea is consumed before or during a meal in Morocco. 1.Atai starts with the washing of the hands, usually with water that has orange flower blossom in it. Once your hands are cleaned, tea ware is brought out, along with the ingredients. The ingredients include: the tea itself (generally a gunpowder green), mint (not to be mistaken for peppermint), and sugar. If mint is unavailable, leaves of Chiba (fresh wormwood) are used in its place. 2. Next, pour a small amount of water into the tea pot before adding the tea and the mint. Shake the pot to rinse the leaves, then dispose of the water. 3. Add sugar (liberally) to the pot and pour new water (close to boiling point) in. Stir the mixture, then let it steep undisturbed for 4-5 minutes (depending on your preferred strength). 4. Pour the tea into glasses from as high as you feel safe, as this is a near boiling liquid (skilled Atai makers can do it from 18 or more inches above the glass). This not only aerates the tea, but generates a froth on the tea’s surface. 5. Next, pour the glass of tea back into pot, and repeat step 4 for further aeration. 6. Serve the resulting brew while hot. 7. Repeat step 4, adding sugar if need be, and serve the second brewing. 8. Repeat once more and serve the third (and final) brewing. Traditionally the tea is served three times to give three different tastes. For every steep you taste, it symbolizes the experience of life, love, and then death. Even though the tea is traditionally served hot, in my opinion, it makes a good iced tea as well. In Morocco, tea is considered an art form and the drinking of it with friends and family members is an important ritual. The technique of pouring the tea is even viewed to be equal to the quality of the tea itself. Tea has become such an integral part of my life for the past year, and I’ve found that indulging in the simple pleasure of tea, while conversing with friends, is something I really enjoy. I think that the Moroccan people also have this thought in mind when performing this ceremony. I hope one day, that I can experience this tradition firsthand. Until then though, my Moroccan mint tea will have to do. Have you any of you taken part in this, or any other traditional ceremony? What tea ceremonies do you personally find interesting? I would love to hear your feedback and stories. This entry was posted on August 23, 2010 by Jordan M. Williams. It was filed under Culture and Ceremonies and was tagged with atai, Green tea, gundpowder green tea, Morocco, Tea Ceremony.